Yesterday Full Moon Features unleashed the first chapter of a new series called Bunker of Blood. Titled Puppet Master: Blitzkrieg Massacre it reads like a greatest kills compilation from the long running Puppet Master series. So, if you were intrigued by the latest release but can do without a lot of useless filler then this release may be up your alley. I am not saying it is completely neccessary, I am just saying it is out there. Have a look at the trailer below. 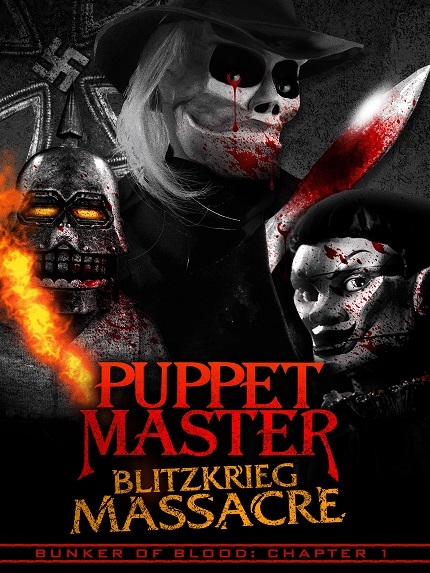 Puppet Master: Blitzkrieg Massacre is available now on Amazon Prime and Full Moon Streaming. Full Moon’s BUNKER OF BLOOD is an 8-part feature film series designed to shock and scare. Drawing from nearly three decades of cinematic splatter and freakish filmmaking, BUNKER OF BLOOD is a gory "Greatest Hits" of the legendary studio's strangest and sickest sequences framed by an all new, outrageous narrative. Using lavish illustrated comic book panels to tell the twisted tale of the masochistic drifter and the mad "guru of gore," the series will drive viewers deep into the dark, dank depths of a madman's macabre lair. This stomach-churning adventure starts off with PUPPET MASTER: BLITZKRIEG MASSACRE, in which The Gore Collector culls the sickest moments from the 11-film deep PUPPET MASTER series, mashing them together with macabre music and brand new moments of body-breaking mayhem. PUPPET MASTER: BLITZKRIEG MASSACRE goes LIVE on Amazon Prime and Full Moon Streaming (www.FullMoonStreaming.com) on September 25th, 2018. DVD releases of each BUNKER OF BLOOD title will follow soon after, which - when all 8 are collected - will reveal a secret mural painting on the spine. Synopsis: In an unknown dystopian future, a drifter with an unusually high-tolerance for pain is held captive in a horrific hospital by The Circle of Psycho Surgeons, a clandestine crew of M.D. 's (that's medical deviants) who are experimenting with human suffering. Suddenly, our shackled hero hears the call of The Gore Collector, a sadistic curator of carnage who is well past his prime and now seeks an heir to take over his evil operation. Escaping from the lurid lab, the drifter enters the underground lair of The Gore Collector – there the perverse programmer pops in a vile videotape and begins the process of trying to warp the man's mind with some of the goriest and most gruesome moments from Full Moon's iconic film franchises. It's an all-out assault to the senses that makes A CLOCKWORK ORANGE's "Ludivico Technique" look like outtakes from Mr. Roger's Neighborhood!